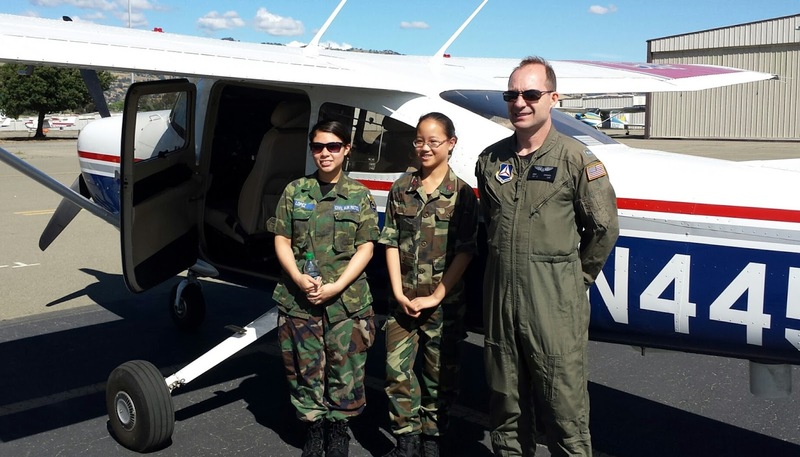 This blog is republished in its entirety, with permission from the John J. Montgomery Memorial Cadet Squadron 36 Spring 2016 Newsletter, edited by 2nd Lt Diane Gaskill. Thank you to Lt Gaskill, to our two cadet authors, and to Lt Eric Choate! These kinds of stories make our pilots happy to keep volunteering their time to offer educational o-rides to our cadets. Can you imagine not only enjoying the experience of flying a plane but also looking down at the beautiful scenery of the Monterey beach, and seeing the beautiful turquoise water and the clear blue sky? During our o-ride experience on Saturday, May 14, we enjoyed the hands on preflight, our wonderful pilot and the experience of actually flying the plane. The preflight, which is the checklist before flying, was very interactive, informative, educational, and precise. We checked every single little thing that could go wrong In the air. Our pilot was very good at explaining why and how we perform everything in the checklist. It was very hands on. We even went up on top of the wing to checked the gas! The hands on part of it made it enjoyable and interesting. Our pilot, Lt. Choate, was very patient. He explained things thoroughly and precisely. He also told us how different parts of the plane work, and why we need to check them while we did the preflight. During the flight, he made sure we understood everything we needed to know and he made sure we were enjoying the flight. We are very grateful to our pilot. He made our experience fun and unique. Before flying, we were a little nervous, but once the pilot took off we were so exited. When he gave us control, we got to actually fly the plane! It was such a unique and special experience. Ashley wrote, "At first it felt like I wasn't ready and I wasn't actually flying the plane, but as soon as I got used to it I had a blast.” During the flight we made a Lot of 360 degree turns to look around because we had extra time. These turns helped to reinforce the way the pilot taught us to turn. We hold the controls in the same position to turn 360 degrees. During our o-ride experience, we enjoyed the hands on preflight, our wonderful pilot, and of course actually flying the plane. After this, we look forward to our next flying experience! We want to thank Lt Gaskill for arranging all the flights, and even changing things so that we could fly together, our pilot for being so patient and interactive with us, and especially our parents, who take care of us and support and encourage us to do well in CAP! With out all of you, this would have never happened.